Born in Newark, New Jersey, on January 16, 1929, he was serving as a Congressman from New York City when he was shot to death in his NYC law offices by Dennis Sweeney, a former acquaintance on March 14, 1980. Sweeney, a civil rights volunteer in Lewenstein's voter registration drives in Mississippi in the mid-1960s, pumped five bullets into the congressman. During his trial, he testified that Lowenstein and others controlled him through radio receivers planted in his teeth. He was diagnosed as a paranoid schizophrenic and found not guilty by reason of insanity. 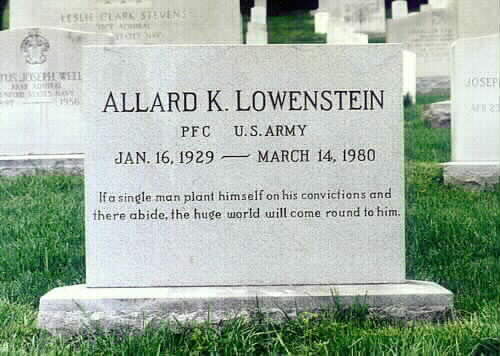 "If a single man plants himself on his convictions and there abide, the huge world will come around to him." 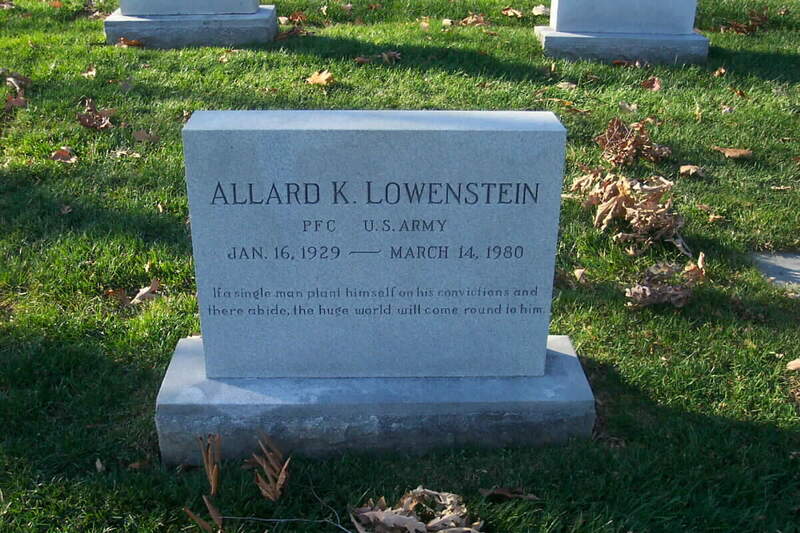 He is buried in Section 30, Grave 2005, Arlington National Cemetery. Representative from New York; born in Newark, Essex County, N.J., January 16, 1929; B.A., University of North Carolina, 1949; LL.B., Yale University, 1954; enlisted in the United States Army, 1954-1956; taught at Stanford University, North Carolina State University, and City College of New York; special assistant, Senator Frank Porter Graham, 1949; foreign policy assistant, Senator Hubert H. Humphrey, 1959; delegate, Democratic National Conventions, 1960 and 1968; elected as a Democrat to the Ninety-first Congress (January 3, 1969-January 3, 1971); unsuccessful candidate for reelection in 1970 to the Ninety-second Congress; unsuccessful candidate for election in 1972, 1974, and 1976, to the Ninety-third, Ninety-fourth, and Ninety-fifth Congresses; appointed to head the United States delegation to the thirty-third regular annual session of the United Nations Commission on Human Rights in Geneva, Switzerland, 1977; alternate United States Representative for Special Political Affairs in the United Nations with the rank of Ambassador from August 1977 to June 1978; unsuccessful candidate for nomination in 1978 to the Ninety-sixth Congress; died from the effects of an assassin’s bullet in New York City March 14, 1980; interment in Arlington National Cemetery.